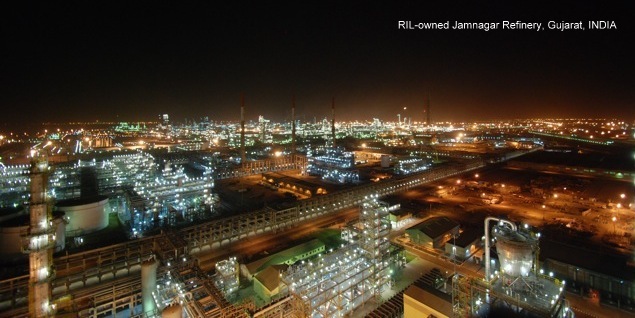 On April 17, 2019, as per the local media reports, Saudi Aramco, the world's largest crude oil producer, is in "serious discussions" to acquire up to a 25 percent stake in Reliance Industries Limited (RIL)'s refining and petrochemicals businesses. Saudi Aramco is a Saudi government-owned petroleum and natural gas company based in Dhahran (KSA). A minority stake sale could fetch around US$ 10 billion to US$ 15 billion, valuing the RIL's refining and petrochemicals businesses at around US$ 55 billion to US$ 60 billion, the report said. Yesterday's share price, RIL has a market capitalization to topping US$ 122 billion (or ₹8.5 lakh crore). Both Saudi Aramco and Reliance Industries Limited were not available for comment. However, a Reliance-owned media portal MoneyControl.com has also released the news about the deal via Reuter's syndication. The talks gathered momentum following the visit of Saudi crown prince Mohammed bin Salman (MBS) to India in February 2019, during which he met Mukesh Ambani. During his visit, he said he expected investment opportunities worth more than US$ 100 billion in India over the next two years. Separately, Saudi Aramco's CEO Amin Nasser had met RIL Chairman to discuss the Saudi state-owned company's businesses including crude, chemicals, and non-metallics. Besides that, during the same trip, MBS also signed agreements worth US$ 20 billion with Pakistan, including a US$ 10 billion deal for an oil refinery while agreements inked in China included a US$ 10 billion refinery and petrochemicals deal. On April 1, 2019, Saudi Aramco reported US$ 111.1 billion in net income last year on revenues of US$ 360 billion in 2018, making it probably the world’s most profitable company by far. It made US$ 33.8 billion in the first half of 2017. Aside from this announcement was also their large bond sale that attracted a massive interest that exceeded US$ 100 billion, which completely oversubscribed their US$ 12 billion offerings. It is above the US$ 67 billion of demand Saudi Arabia saw for its first government bond issuance in 2016. But according to Colby Smith, a journalist with Financial Times, "But, there's a risk of reading too much into the size of the order book. More often than not, it is a skewed metric of demand." In parallel to on-going development, on April 15, 2019, Saudi Aramco has agreed to buy a 13 percent stake in South Korean oil refiner Hyundai Oilbank for ₩1.4 trillion (US$ 1.24bn) from Hyundai Heavy Industries Holdings via an Aramco subsidiary, Aramco Overseas Co. BV (AOC). The deal also includes granting Saudi Aramco a call option rights to buy a 2.9 percent stake owned by Hyundai Heavy Industries Holdings later.